Let’s get rid of private housing. Plenty of time and effort have lately gone into analyzing a host of related crises—homelessness, unaffordable urban real estate, devastating gentrification, and a housing bubble whose burst landed us in the Great Recession. But the explanations tend to be incomplete, the attributions shortsighted, and the policies rearguard. For every liberal who insists that deregulating zoning laws will curb skyrocketing urban housing prices, there’s a conservative who blames the 1977 Community Reinvestment Act for the housing bubble, and none of them is anywhere near the mark. The true culprit is so deeply embedded in American notions of wealth, rights, and property that we cannot see it for the terrible economy policy it is: private housing. Real estate as a store of private wealth is the rotten tree that sprouts these diseased branches, and the solution is to quit pruning twigs and chop the sucker down. I’ll propose some models and policies that can do the trick, but first—what is private housing, exactly? First off, it is mostly land. That is, real estate is the most valuable asset form in the United States, and the majority of that value is not that of the building itself, which depreciates until it requires renovation, but of the “unimproved” land it sits on—the location. Imagine a skyscraper filled with sumptuous luxury condominiums, located in the center of Antarctica: However many millions had gone into its cutting-edge furnishings, without a community (parks, transit options, schools, shops, etc.) around to situate it in a desirable location, that building would be worthless as a real-estate investment. These community resources are reflected in what is commonly called “land value,” but is more precisely the price of the location. Rather than flowing to the community that created it, however, it is captured by individual real-estate owners. Imagine sumptuous luxury condominiums...in Antarctica. It's community that creates housing's value, not the building. More fundamentally, though, what we call private housing is actually public land that government has set aside for private purposes. Land, save the bits beneath one’s feet, can’t be “possessed,” as a phone or a shirt can. What a “land owner” possesses is a deed—a voucher one may redeem with the government to marshal violence (through policing) to exclude all competing claimants. The government established this location-exclusion program, designating pieces of nature as being solely for the use of the deed holders, and devoting its violent capabilities to enforcing that designation. In the 19th century, the government enacted homesteading laws to allow frontier settlers to claim indigenous lands as their own. If those deeds were challenged, the federal government sent troops to back them up. Or look at the 20th century, when the government funded highways and commuter transit—the Federal Housing Administration extended loan guarantees to new housing developments in order to create a massive suburban private-housing stock. The entire apparatus by which housing is privately “owned” is created by the government’s decisions to subsidize or protect certain interests. For a start, everyone should be compensated for their exclusion from passage over certain locations on the earth. To do this, we ought to levy an exclusion fee whereby the location price of the property in question would be returned to its rightful recipient, the community. As long as land value is socially created and land ownership is duty-free, a theft is occurring. The idea for such a fee was most famously advocated by political economist Henry George in his book Progress and Poverty, under the name “single tax” or “land-value tax.” Several municipalities in George’s native Pennsylvania have a version of it: a two-tiered property tax, wherein the assessed value of the location is taxed at a higher rate than the assessed value of the building. For best results, 100 percent of the location price should be confiscated and invested in a sovereign wealth fund, the way Alaska’s oil royalties are. That fund could either pay out universal dividends, the way the Alaska Permanent Fund does, or provide the public with a huge pool of resources with which to invest in public institutions. How huge? Michael Hudson estimates that the land value of New York City alone is greater than the total combined worth of the entire country’s productive infrastructure. An exclusion fee effectively makes the land public, leaving the “owners” of the buildings without a way to collect more in rental income than the building, distinct from the land, is worth. But why endow private profit-motivated interests control over construction at all? There is no reason to suspect that a given property-development capitalist should be more capable of determining for a community what optimally desirable new buildings to produce than the community itself is. Luckily, there is an entity capable of turning development over to the most concerned parties: nonprofit community land trusts, their boards typically composed at least one-third of residents, take land off the market, and lease homes long-term to residents at below-market rates, retaining the majority of the home equity gained over time. The predominantly black and Latino residents of the Dudley Street area of Roxbury, one of Boston’s poorest neighborhoods, got Boston city officials to take the unprecedented step of granting the power of eminent domain to the community for more than 1,300 parcels of abandoned land. With this tract, the Dudley Street Neighborhood Initiative (DSNI) established a community land trust that has democratically directed a renovation project resulting in hundreds of affordable-housing units and other public spaces, among them community centers, new schools, a community greenhouse, parks, and playgrounds. 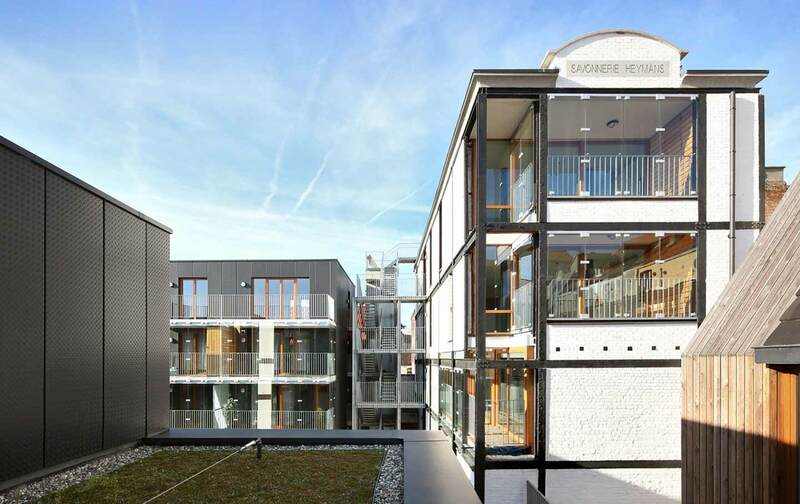 Moreover, while a private capitalist-driven housing system must prioritize cost over all other considerations, the Vienna model situates expense amid three other equally weighted factors: architectural quality, environmental performance, and social sustainability. This forecloses, if the expression can be excused, the possibility of the sort of ghettoization that has been endemic in US public-housing programs. To emulate the Vienna model here, significant federal funding should be provided to municipalities to buy land (or claim it by eminent domain), and build gigantic stocks of public housing, with a specific emphasis on environmental soundness, and diversity of class and ethnic background. The Dudley Street Neighborhood Initiative transformed more than 32 acres of land in Boston from commodity to community. Regarding how it was able to perform this transformation, and how it has successfully resisted an economic system that greedily militates for land to be privatized, Eliza Parad, a DSNI community organizer, cites “the political power this community, a majority community of color, has built since the 1970s.” As the lives of the Dudley Street neighbors testify, land removed from the private market, de-commodified, and placed under the ownership and management of the people who live there is land that creates and renews its own political constituency. Likewise, the Vienna model of public and publicly managed housing is politically insulated, because it encompasses nearly half the city. In US cities, the residents of public-housing projects constitute a small minority of easily marginalized and maligned poor people, ill-equipped to do battle with landed interests. Thus, Baltimore offers millions in tax breaks to developers to buy up the public housing stock, while the working-class Viennese residents of Karl Marx Court enjoy their saunas. Gentrification, home-mortgage bubbles, homelessness, skyrocketing rent—these are not facts of nature. They are the outcomes of the policies that consign the basic human need of location to the whims of rent-obsessed landlords and chop-licking speculators looking for an easy flip. Private land policies are as evil today as they were almost 4 centuries ago when the Pilgrims near Bridgewater, Massachusetts, arrested Wampanoag people for hunting on a tract of land after the Pilgrims had “purchased” it. “What is this you call property?” the sachem, Massasoit, argued on that occasion. “It cannot be the earth, for the land is our Mother…. everything on it belongs to everybody and is for the use of all. How then can one man say it belongs to him only?” There was no satisfactory retort then, and there isn’t one now.